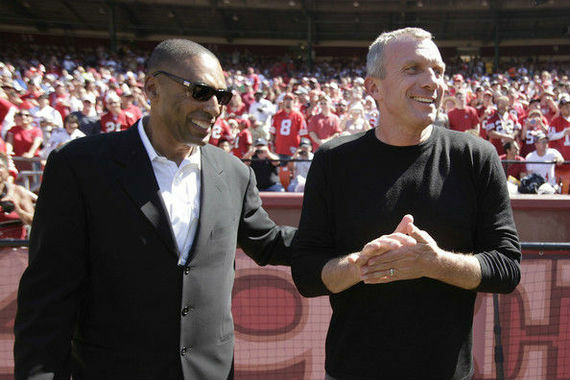 The two guys in the picture, for anyone who doesn't recognize them, are 49ers' legends Joe Montana and Roger Craig. Montana is in the Hall of Fame, Craig is not. The fact that Craig remains outside the Hall is an absolute joke. The NFL released their list of finalists for the Hall of Fame just a few days ago. Expected names such as Brett Favre and Kurt Warner are on it, along with running back Terrell Davis. Once again, Roger Craig did not make the cut. For his career, Craig rushed for 8,169 yards, and scored 56 times. Through the air, Craig posted 4,911 receiving yards and 17 touchdowns, dwarfing Terrell Davis who posted less than 1,500 yards through the air. Davis also rushed for less yards, although he scored four touchdowns on the ground. But, where a guy takes a step forward, and becomes a Hall of Famer, is when he changes the position that he played. Roger Craig changed the position of running back, which is why he needs to be enshrined in Canton. Prior to the days of Roger Craig, running backs were expected to do one thing; run the football. They were used in the running game, but hardly ever in the passing game. Take Walter Payton, the best running back at the time. Over 13 seasons in the league, Payton never caught more than 53 passes in a season. Jim Brown, known as the greatest living football player, never caught more than 46 passes in a single season. Roger Craig came around and changed all of that. Over a span of five years, Roger Craig posted the following reception numbers: 71, 92, 81, 66, and 76. His crowing achievement came in 1985, when Craig became the first running back in NFL history to rush for 1,000 yards, and catch passes for 1,000 yards, in the same season. Roger Craig paved the way for the players young fans are more familiar with, like Marshall Faulk, and Darren Sproles. Marshall Faulk had a role because of a player like Roger Craig. He changed the way coaches used the running back position. He changed the way it was played. Only one skilled position player from the NFL team of the 1980's is not in the Hall of Fame, Roger Craig.